More EHF Champions League FINAL4 tickets to be released, VIP Tickets go on sale. More tickets to be released, VIP Tickets go on sale. Vienna, 8 February 2010 - Organisers of the EHF FINAL4 are about to begin the second phase of ticket sales for the Men’s EHF Champions League FINAL4, which will be played in front of 19,000 spectators in Cologne’s LANXESS arena on 29 and 30 May 2010. Ticket have been selling fast for the event since they first went on sale in September 2009 at the start of the EHF Champions League season, with handball fans from across Europe buying some 12,000 weekend tickets so far for the two-day highlight of the 2009/2010 season. Wednesday 10 February 2010 sees the release of a limited number of remaining tickets in categories one (200 EUR) and four (50 EUR) via the ehfFinal4.com website and ticket hotline +49 221 280 288. Tickets will be available from around midday on Wednesday. This week also sees the release of a brand new ticket category – EHF FINAL4 VIP Tickets and VIP Boxes – offering the chance to experience the EHF FINAL4 from an exclusive VIP Seat or Box with a delicious three-course meal, choice of hot and cold drinks, official EHF FINAL4 Programme and VIP Parking. Exclusive VIP Boxes with hostess service are available for 12, 14 or 16 people. VIP Tickets and Boxes go on sale on Wednesday via the ehfFinal4.com website or for more information send an email to championsleague@ehfmarketing.com or call direct on +43 1 80151 214. A VIP Ticket costs 585 EUR (+VAT). VIP Boxes are available from 8020 EUR (+VAT) with all VIP Tickets and Boxes valid for both days of the EHF FINAL4 and all four matches, including Semi-Finals and the EHF Champions League Final. 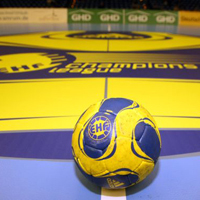 All tickets can be ordered online via the official website at www.ehfFinal.com from Wednesday 10 February 2010. Information on further ticket and hotel packages from Vietentours as well as exclusive Corporate Hospitality from partner company, booker, can also be found on the official website.